The calf is composed of two major muscles: the gastrocnemius, a large muscle located near the top of the calf, and the soleus, a smaller muscle on the inside of the calf. Most women want these muscles to be toned so they can have shapely, attractive calves. Fortunately, there are some effective calf exercises that can help tone your calves. It is important to do these exercises safely. 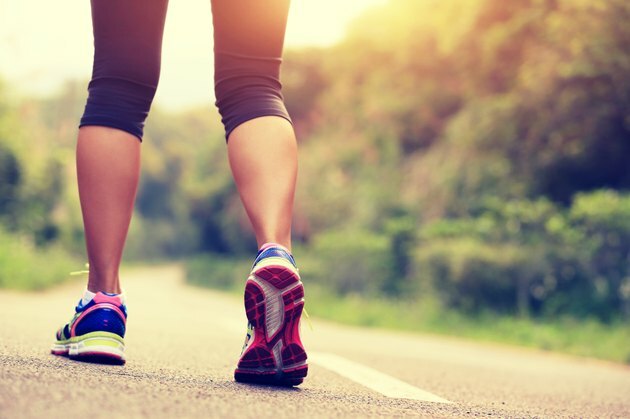 Always warm up thoroughly first by walking or jogging slowly for at least 10 minutes, use proper form and stay focused on what you are doing at all times. It's also best to do only one of these exercises each day to avoid soreness and injury. Basic running will tone your entire leg. To work your calves more, add sprints once a week. After you are warmed up and have run for at least 20 minutes, sprint for 30 to 60 seconds. Recover by walking or slowly jogging for 30 to 60 seconds. Repeat the sprint-recovery cycle four to eight times. Find a smooth stretch on the beach, golf course or football field. After you have warmed up by running for at least 10 to 20 minutes, take off your shoes and run barefoot for 10 to 20 minutes. You will be surprised at the workout your calves get when you run barefoot. Jumping rope forces you to stay on your toes, which works the calf muscles. Jump rope for 1 or 2 minutes as a warm-up before your daily workout of running, biking or swimming. Build up to 5 to 10 minutes of jumping. The leg press machine is mainly used to work the quadriceps, but with a simple tweak, it can work your calves too. Sit on the machine and put the balls of your feet at the bottom of the push plate, where your heels would normally be. Now push the plate using only your toes and the balls of your feet. You will most likely need a lighter weight, because your calves are doing most of the work, not your quadriceps. Repeat 10 to 12 times on each foot and build up to three sets. With your toes on the edge of a step, block or large book, rise up onto your toes and the balls of your feet. Then slowly lower yourself back down and drop your heel below the edge. Repeat 10 to 12 times on each foot and build up to three sets. Keep your posture straight and use a handrail for balance if needed.